Windmill Sprinkler and Hardware carries a large selection of nuts, bolts, screws, nails, fasteners, hooks, locks, ladders and whatever else you may need to get your project done. We literally stock thousands of items in our hardware department. From screws and safety equipment to letters and ladders we have it all. Stop in and talk to the helpful folks at the service desk to help you find exactly what you need. Windmill Sprinkler and Hardware only carries time tested, top quality brands like Loctite, J-B Weld, Hillman, Werner, Master, Krazy Glue and Forney. We’re the local hardware store you’re looking for. Windmill Sprinkler and Hardware is a certified C3 ChipKey maker. 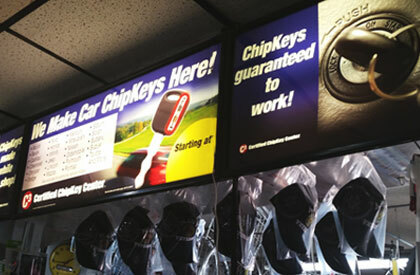 Our chip keys are guaranteed to work for Acura, Buick, Cadillac, Chevrolet, Chrysler, Dodge, Ford, Honda, Infiniti, Jeep, Lincoln, Mazda, Mercury, Mitsubishi, Nissan, Oldsmobile, Plymouth, Saturn, Scion, Subaru, Suzuki, Toyota and more.